A lot of many moons ago a friend of ours was telling us all about this exciting adventure he was about to embark on, as the manager of a non-profit business, training and supporting young people in a cool and trendy coffee house. This place was to have art and music and creativity at it’s core. And boy-oh-boy did that fella pull it off! 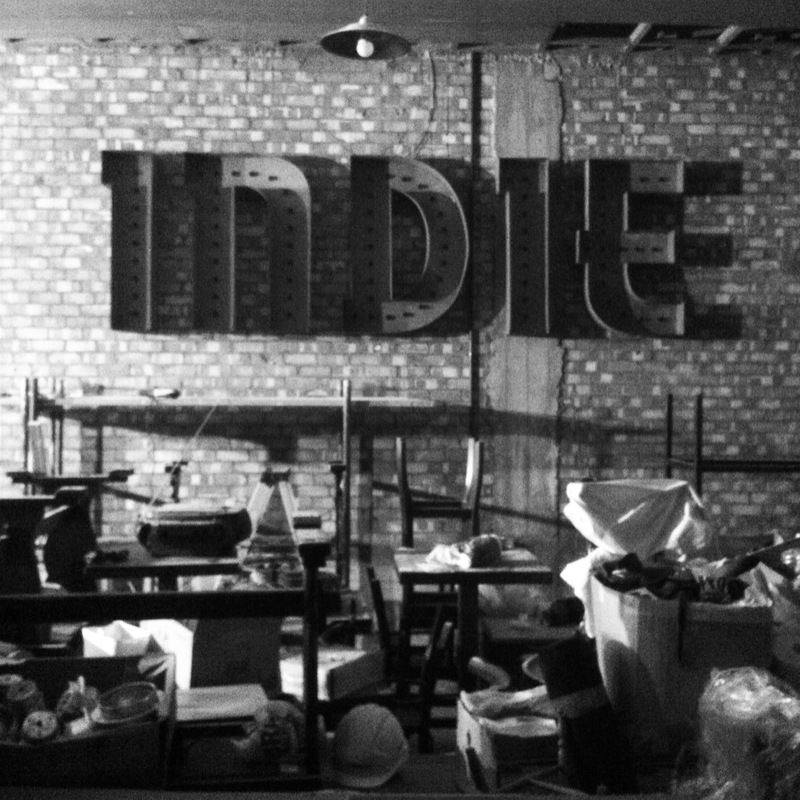 Cafe Indie is where I started to work as Pigeon Vintage. I hosted my very first pop-up stall there and continued to do this until I felt confident enough to go for the big fairs. I loaned a few of our own bits of home furnishings to Indie too, until they got much too cool for our old tat. 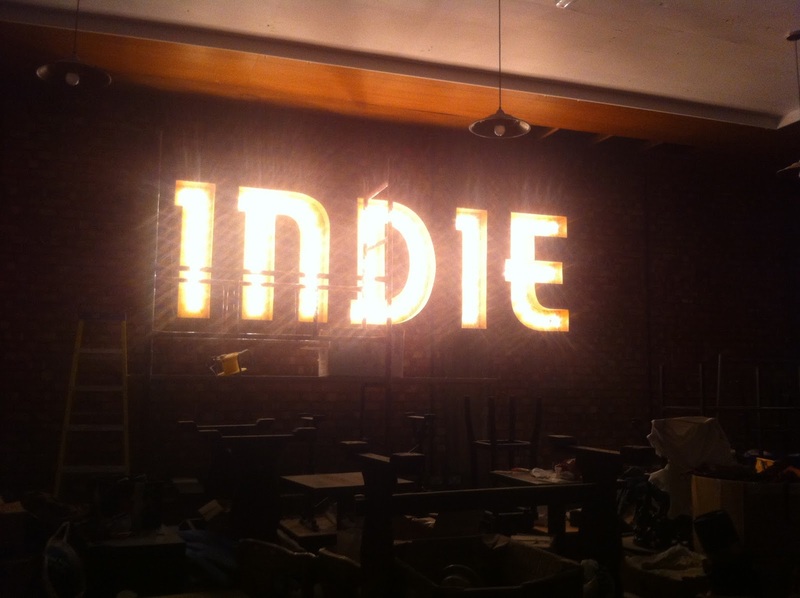 One thing that has remained a permanent fixture and plays a part in creating the venue’s quirky atmosphere, is their famous INDIE sign. Some of you may know that the sign was made at Pigeon HQ, by the scuffed gnarly hands of Mr Pigeon! The Café Indie project was getting some outrageous quotes for a light up sign and I mentioned that we would probably be able to give it a good go. Being the perfectionist that Mr Pigeon is, I knew it would only ever be an amazing outcome. So? I lost him to the garage for the next few weeks, while I stayed inside beginning my own exciting adventure (we were in the early weeks of my first pregnancy and I was suffering from delightful morning sickness). The sign is made from sheet metal that was cut and bent to shape using an industrial machine that Mr Pigeon had to build from scratch (he’d salvaged it from a skip years ago and never needed to use it until now). 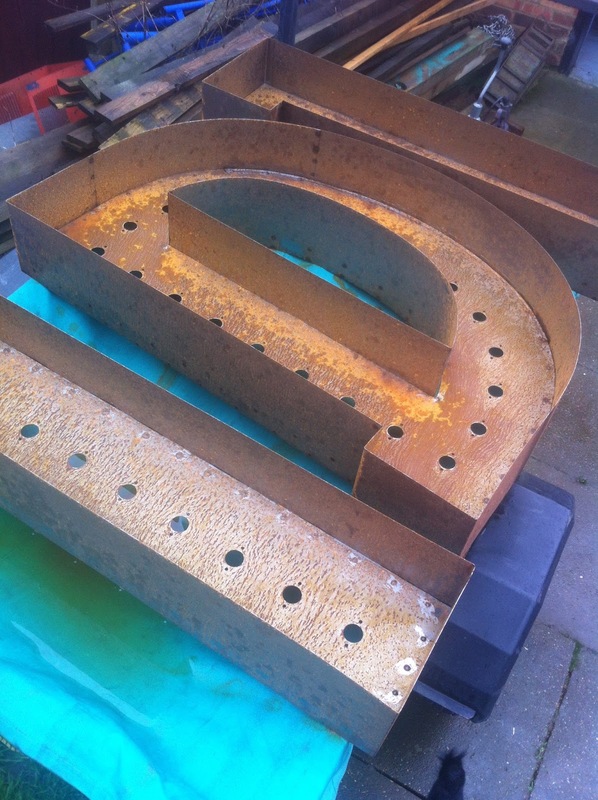 To get the industrial look, once the letters were made he sprayed them with a salt solution and left them outside overnight to get them to rust. I’ll never forget the night that he sent me this next photo; the first working component standing proud atop his workbench. 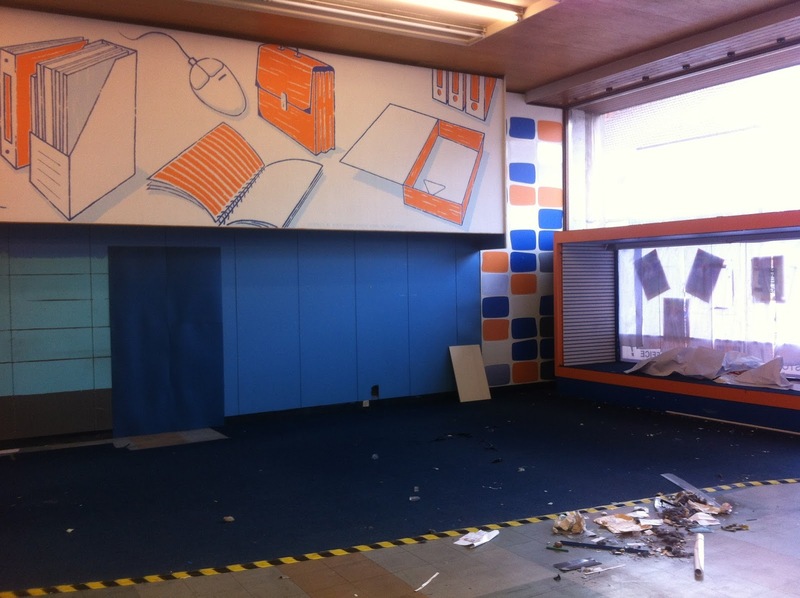 I was working at the youth centre and gasped with shock at how good it looked. I knew it would, but THIS good? I was a proud girl, carrying this man’s baby. It was a bit overwhelming. It took a few days to put up, because of the size of each letter and availability of people to help, but this was the sign installed before the bulbs were put in. 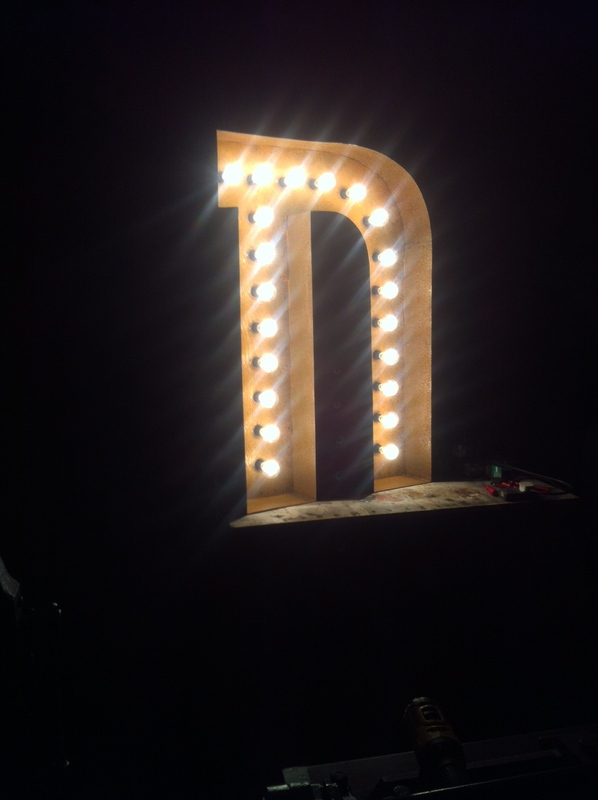 To give you an idea of scale, the letters are 120cm high. Being the modest beast he is, Mr Pigeon switched the lights on without telling people. There were so many people in the building, helping to pull walls down, paint chairs, build furniture, clean floors and so on; but none of them knew what spectacle was about to occur. Everyone cheered and applauded and stood agog. It looked fab and felt like the beginning of what has become a bit of an Indie revolution for us all. 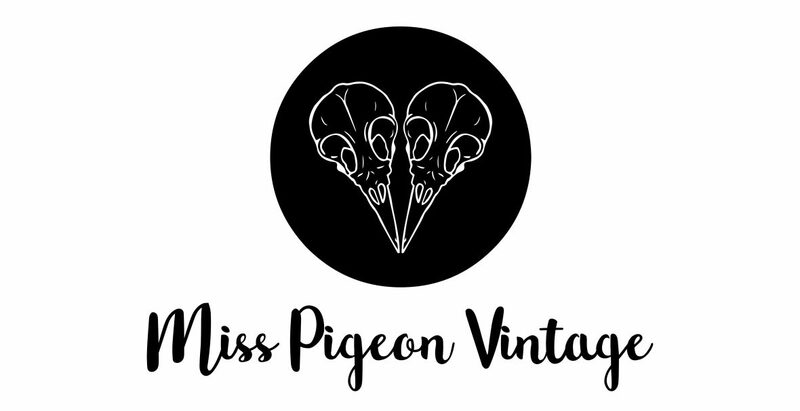 Since then, the sign has featured in band photos, promo pictures, blog feeds, student selfies, instagram check-ins… it’s part of the heart of Cafe Indie, and I couldn’t be more proud of Miss Pigeon Vintage for being the maker of something so iconic!